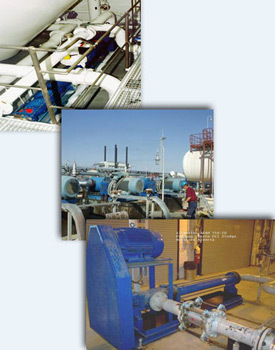 After leaving the Heater Treater system the dehydrated crude is delivered to the pressurized Desalter vessel‚ in which harmful contaminants like salt‚ clay‚ silt‚ rust and other debris are removed. It is critical that these undesirable reservoir residues are extracted from crude oil to avoid costly corrosion and fouling of downstream equipment. Over time‚ these separated solids will accumulate in the bottom of the Desalter vessel; hence‚ the Desalter must be periodically washed to remove this accumulation. To handle this cleaning operation‚ a "mud washing" system is installed in the bottom of the vessel to periodically remove the solids. Mud washing consists of recycling a portion of the Desalter effluent to agitate the accumulated solids so that they are washed out. These solids are then routed to the wastewater system. In both services pumps are required. The operation of a desalting system can be very challenging‚ due to changing process variables. At best‚ it is a process of measuring trade-offs and compromises. A delicate balance must be maintained while controlling mixing intensity and feed levels to provide optimal salt removal. The fluid-handling equipment supporting the Desalter must be reliable and robust enough to withstand aggressive levels of corrosive and abrasive wear‚ as well as the arduous start and stop cycling of this intermittent duty. Upstream facility managers and operators around the globe have realized that volumetric‚ rotary PD pumps are something they can capitalize on in these services. Having a machine that can reliably handle variable inlet and outlet conditions with non-homogeneous‚ gas-laden (sour and sweet)‚ and contaminated‚ viscous process fluids is critical. These strengths‚ coupled with the tremendous turndown flow capabilities of rotary PD pumps‚ make them an ideal fluid-conveying solution for your crude oil desalting systems.